High atop volcanic mountains of Colombia and Central America and cascading down hillsides are thousands of acres of sprawling green coffee bean farms. Hundreds of years old, each farmer takes immense pride and care in the traditions of farming coffee. This is simply the best coffee bean, sourced specifically for our Military Java Group brands of coffee, and custom roasted to ensure a first class coffee drinking experience. The journey from tree to cup requires many steps… It takes approximately three years before a coffee tree can begin to bear fruit, and five years until fully productive. 1. Harvesting involves labor-intensive hand selection of the ripest coffee cherries. 2. Coffee beans turn a radiant deep cherry red when ripe. 4. Dried green coffee beans are sorted and graded, then bagged in preparation for shipping throughout the world. 5. Housed in shipping containers, the green coffee are loaded onto cargo ships. 6. Strict quality control by testing each batch of beans by cupping. Coffee cupping measures the coffee by body, sweetness, acidity and flavor. 7. Roasting is a craft that requires attentiveness and determines the final coffee flavor profile. 9. And finally, your cup of aromatic, rich flavored Military Java Group coffee to enjoy. 10. 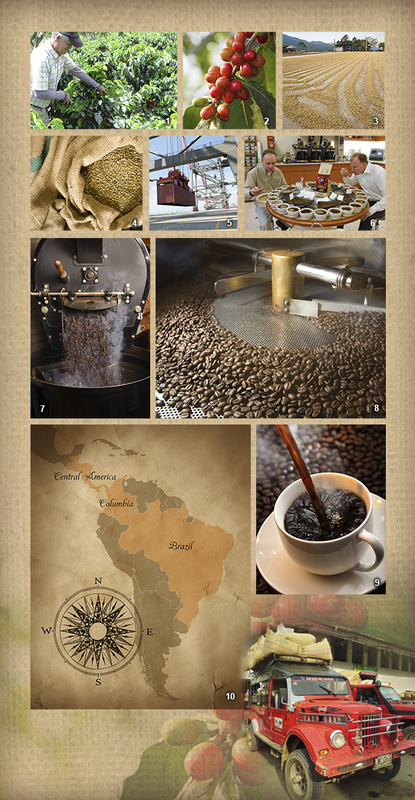 Jarhead Java coffee is sourced from the Colombian regions of Antioquia, Caldas, Tolima and Huila in Colombia. Bravo Zulu Java and Stars & Stripes Java are a blend of high grown coffees from Central America and fine cupping Brasil coffee produced in the Alta Paulista and Cerrado regions located in the States of Sao Paulo and Minas Gerias.